On Wednesday, I headed to Spokane, first to meet with Dori Whitford and her creative writing class. After that, I hung out in the runner/writer way until Mead High Schools cross country meet in the afternoon. A recap of the racing can be found over at InlandXC's Blog. A true pro at marketing would have gotten pictures of himself in front of the class. I was too busy yakking. Dori's creating writing class was interesting. For those that think teaching is easy, trying to hold the attention of 30-some odd teenagers can disabuse you of that notion. Fortunately, most of them were paying attention and a good sized group actually engaged and asked some very cool questions. The questions ranged from the creative process - what do you do when you get writer's block (which I'm lucky enough to avoid for the most part) - to the process of publishing - how do you get a self-pubbed novel onto the different platforms. My favorite was "Do you have any plans for novels that don't include running?" As I expected, and Dori warned, some of the kids are very introverted and introspective. Since I'm that way myself, I get it, and appreciated the effort it took for some of those young men and women to ask questions. They won't understand how much I appreciated the help. this was my first presentation to a class like this and I was totally outside my comfort zone. I'm not a natural speaker and it takes major effort to get in front of people - but I love conversations and we ended up with a nice give and take. So much so that I almost ran the class out of time. There was one young man in there that apparently reads tech manuals for HVAC equipment so we talked briefly about home inspections. My kind of kid. After the presentation and before the meet, I went and ran the switchbacks near the school. For those interested, the pictures are a few posts below. It was a pleasant run, my first this season in long sleeves. Winter lurks. I headed back up to a small strip mall to grab a bite to eat. The restaurant, conveniently enough, was right next to Runner's Soul North. I ducked in with a book and had a nice conversation with a young lady who had a creative writing degree and knew Rachel Toor. Very cool. I left her a copy of the book with an offer to drive up for a book signing. they had been thinking of having one with Rachel and might have us there together. I'm betting Rachel has more fans than me so I hope she doesn't mind . It just dawned on me (it's early and I'm a pot short of coffee yet) that you may not know that Rachel Toor is the author - a good one! - of On the Road to Find Out. 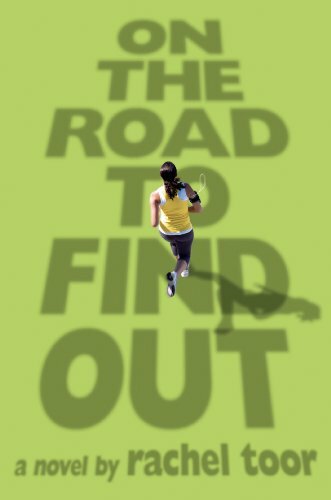 Her novel is very different from mine, with probably more mass appeal as it combines a coming of age story of a young lady with a new found love of running. I haven't met her in person yet despite the fact that we live only a couple of hours apart. Hopefully that will change soon. And think about buying her novel. It's an interesting read that goes in directions you don't expect. It's okay to buy mine, too. Really, there's no reason not to do both. Off to cover the District 7/9 2A/2B meet in Clarkston. Next weekend, it will be regionals in Pasco. If you want your book signed, track me down -any of the Asotin kids or parents can point me out - and I'll autograph your copy.